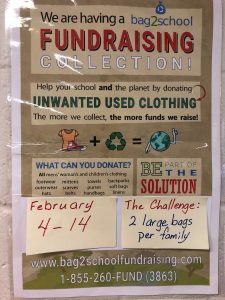 Help your school and the planet by donating unwanted used clothing. St. Elizabeth Seton is asking for your old clothing donations. The challenge is two large bags per family. The more we collect, the more money we raise for our school!! We will be collecting any unwanted used clothing, footwear, hats, mittens, purses, backpacks, linens, towels, belts and scarves. Drop off your donation in the front foyer between Febraury 4-14.